Welcome to Basic Action Games! We are the makers of BASH! 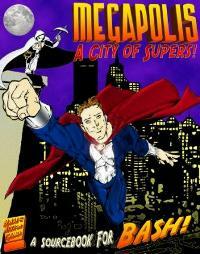 Basic Action Super Heroes, a fast-paced, rules-lite superhero rpg. For a free demo, or to learn more about a product, click its cover image. To come back here, click our logo above. 11/9/2012: Awesome Powers #1 Released. You'll also find all new Limitations and Enhancements (like Esoteric Training and Unbreakable), entirely new Powers (like Absorption and Trample), how to create your own Powers, and Random Character Creation! Each of the powers presented here explains how to replicate the power described as closely as possible using the existing BASH! Ultimate Edition rules. 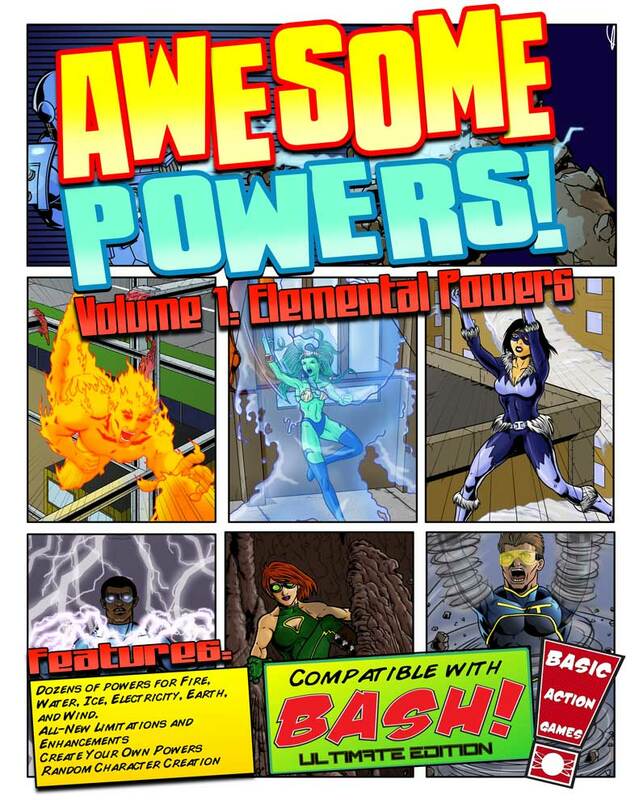 In this first volume of Awesome Powers, we present to your six themes, or Power Suites, each based on a different elemental force. Future supplements will include Plant, Animal, Technology, Artifact, Psionic, and various other Power Suites. Look for our KickStarter (coming soon) to secure your next volume and cast your vote what Power Suites come next in Volumes 2 and on. Get Awesome Powers: Vol. 1: Elemental Powers Here in PDF form. 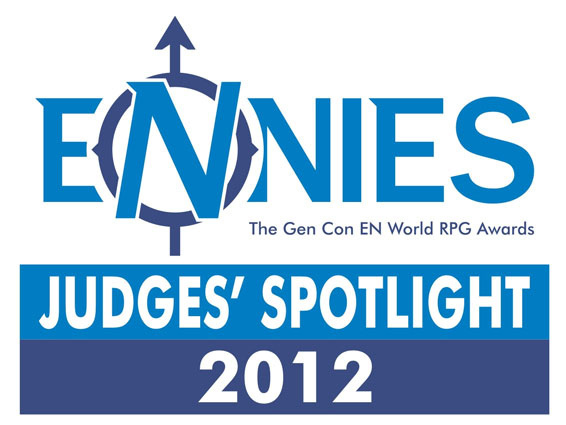 8/30/2012: Honor + Intrigue Wins "Judges Spotlight Award" at the 2012 ENnies! Want to see what all the fuss is about? Get your copy of Honor + Intrigue today! Look below for the purchase option you like best. Basic Action Games is happy to announce our new product line , Honor + Intrigue, is now available! Honor + Intrigue is a new, standalone game from Basic Action Games. Inspired as much by Hollywood as by history, Honor + Intrigue pays homage to the swashbucklers of the silver screen as well as great works such as those of Dumas and Sabatini. Game Masters should feel free to use history as a source of inspiration, not a restriction. True to its inspiration, Honor + Intrigue plays fast and cinematic, leaving the focus on drama and action unfolding. Read more about the game HERE! . Order Yours today while there are slots remaining by making a selection below, then clicking the "Pay Now" button, or Click Here for more information. The full color 2nd printing of BASH! Ultimate Edition is now available! It can be purchased directly from Cubicle 7 or ordered from your Friendly Local Gaming Store! Errata from this printing can be found here. 2/16/2011: BASH! Comic Character Cavalcade Pre-Order! 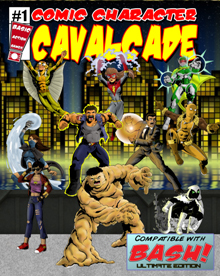 Basic Action Games is proud to announce that we are taking Pre-Orders on the Comic Character Cavalcade! What is that? Up to 50 BASH! Fans who pre-order will get to see their BASH! Character brought to life, published in this full color Cavalcade of Fifty Characters. Find out more about it here! 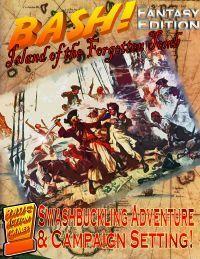 Cubicle 7 Entertainment has begun taking pre-orders for a full color printing of BASH! Ultimate Edition. Not only will this printing be in color, it will have MORE artwork to gawk at! In addition this printing will address errata and has added a few extras. Already bought a BASH! pdf? That's okay! When the new pdf is available, you should be able to update your file for the newest version. Stay tuned for updates, folks. This one is projected for April. 1/30/2010: Vigilance Press has been busy and has greatly expanded its World War II line for BASH! UE. You'll find WWII teams from Allied Heroes (US and UK) to Axis Villains (Germany, and Japan). There is also an adventure, The Ice Palace. And there's more to come! 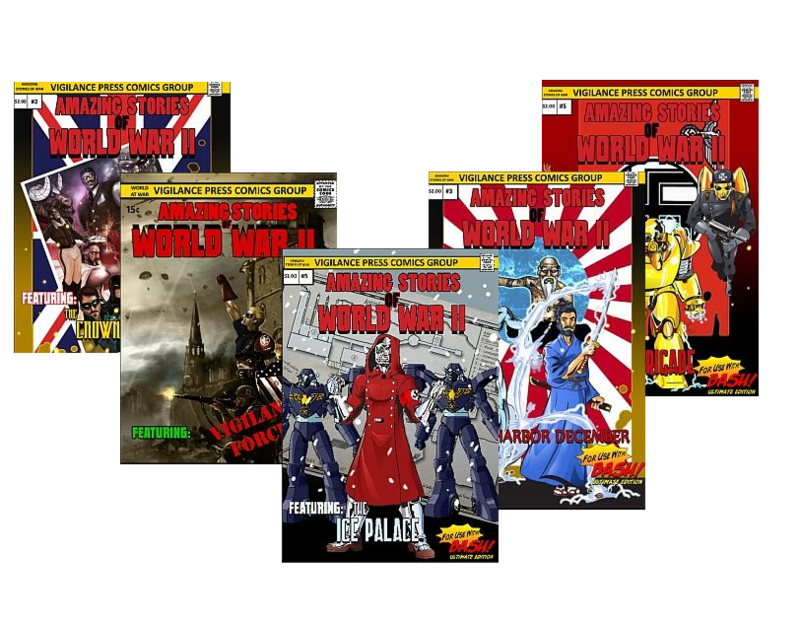 12/10/2010: Vigilance Press has begun to release its World War II series, compatable with BASH! Ultimate Edition. The first product in the line is "The Eugenics Brigade", a collection of Nazi Villains to use in your WWII campaigns. There are going to also be more releases in the line in the near future. 7/9/2010: BASH! 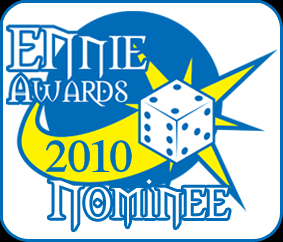 Ultimate Edition has been nominated for an ENnie award in the "Best Rules" Category. Don't forget to vote. Voting for Best Publisher also begins today. 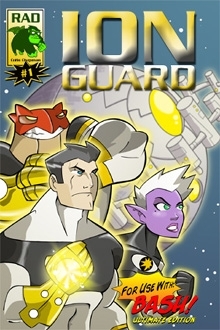 7/1/2010: Radioactive Ape Designs has released ION Guard, the first licensed third-party product for use with BASH! Ultimate Edition. 5/14/2010: Chris Rutkowsky, creator of BASH! talks to Ron & Veronica about BASH! and all things superheroes on The Games the Thing podcast. Check it out! 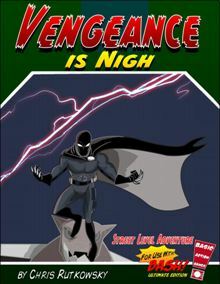 5/10/2010: Vengeance is Nigh, a Street-Level Adventure for BASH! Ultimate Edition has been released. It is now available on Rpgnow.com, Indie Press Revolution, and Pigames.net. The adventure itself, meant to be played over 1-3 issues of play. The Secret Origin of Vengeance. Background material on some of Megapolis' areas and organizations. 10 Characters for your roster, including six playable Heroes (The Defenders of Megapolis), Vengeance, and a few others (sorry, no spoilers here). 4/8/2010: We've set up new fully hosted forums at a site of our own: BASHtalk.org. Come on and join the conversation! 3/24/10: BASH! Ultimate Edition is back in stock at IPR! You can still get the Print + PDF Bundle there! 2/25/10: New BASH! Forums have been set up. Come check them out and say hello. We'd also like to thank the Grognard's Tavern for hosting our boards for so long. 2/4/10: Basic Action Super Heroes: Ultimate Edition is now available as a Print + PDF bundle on the Indie Press Revolution website. $25 dollars gets you a printed book and pdf (essentially, we're throwing in the pdf for free with your printed copy). If your FLGS (friendly local game store) does orders with IPR, you may be able to order it through them as well. 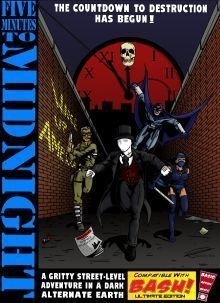 1/15/10: The pre-orders have sold out, and a new print run is begining. 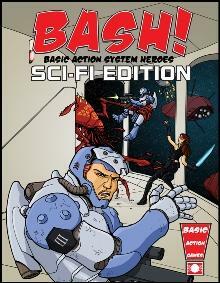 Basic Action Games has joined Indie Press Revolution and printed books of BASH! Ultimate Edition will be available there, as well as from their affiliated stores. For now, you can buy the pdf at IPR as well as our other online gamestores. 12/23/09: Orders have begun shipping out to customers who pre-ordered and paid shipping. 11/12/09: You can see a preview of BASH! Ultimate Edition here. Sorry, but the Pre-Orders have sold out! But another print run is begining, True Believers! 10/11/09: Basic Action Games and Beyond Belief Games are teaming up! Our own "Honor & Intrigue" project is merging with a 17th Century adaptation of BBG's "Barbarians of Lemuria". As of right now, a new name for the product is yet to be determined- but it will be a cinematic game of 17th Century Flintlock, Sword & Sorcery. The game will use the core rules of Barbarians of Lemuria, with new rules to cover swashbuckling duels, ship-to-ship combat, and new careers to emulate the 17th century genre. 10/1/09: BASH! Creator Chris Rutkowsky discusses how BASH was created, BASH! Ultimate Edition, and his local gaming club with Conan on the Rpg Haven podcast. 9/16/09: As of right now, BASH! Ultimate Edition is behind schedule, due to layout concerns. We had hoped to be able to offer Pre-Orders last month, but this will have to be postponed until a new layout can be completed. Basic Action Games appreciates your interest in the product, and will keep you apprised of details as they arise, true believers! 8/14/09: BASH! creator Chris Rutkowsky talks all things comics, and BASH! Ultimate Edition on Meanwhile... the Super Gaming Podcast. 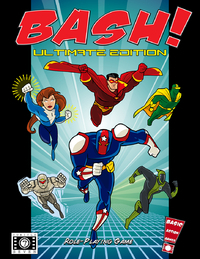 6/22/09: Basic Action Super Heroes: Ultimate Edition is in the works. We should begin taking pre-orders in August. Read more about it and peruse the cover! 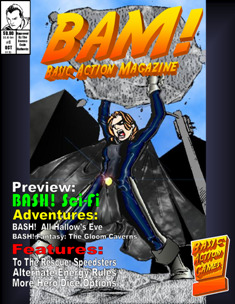 6/20/09: Basic Action Games is now on Facebook! Come join to get updates, chat, or discuss BASH! or Honor & Intrigue. 6/18/09: Basic Action Games is proud to announce an entirely new system in the works: Honor & Intrigue, a game a cinematic swashbuckling action. You can read more on it an check out the cover at the link above. 6/10/09: Basic Action Games books are now available on Amazon.com. You can buy BASH! Sci-Fi Edition and Basic Action Super Heroes there. 6/8/09: Basic Action Games wants to hear from you ! Do you have an idea for a game, adventure, or article? Do you have some houserules or characters that you are dying to share? Let us know! Fan contributions are how we make BAM! possible, and we're always open to good ideas! For those who want BASH! in hardcopy, it is available now at our printing partner, Lulu.com.